I get a lot of mixed feedback when I say that adults need to learn to speak openly about race with young children. They are afraid of spoiling their childhood or crushing their natural curiosities. However, when we look at the root causes of racial inequity in this country, we see that they grow out of the lessons we learn in our earliest years. In fact, honest conversations about race have a positive impact on children, honoring their observations and lived experiences, and better preparing them to recognize and undo social injustice in their lives. Then, why don’t we do it more? The truth is that most of us adults have incomplete and competing ideas about the role of race in our own lives. Young children’s comments often illuminate the uncomfortable gap between our good intentions and the thorny truths of the world. In my experience over the past two years facilitating Border Crossers‘ ”Talking About Race With K-5″ workshops and seminars, I have had the opportunity to share struggles, dissect scenarios, analyze the institutions around us, and offer support in developing and implementing concrete tools and strategies with over 400 educators, activists and parents. I have learned a tremendous amount from each of them. Over and over, I hear the same excuses for why adults don’t have conversations about race with children. In this article, I dissect five common myths of talking about race with children and offer a few simple sentence starters that help reframe the approach. Research shows us that children do, in fact, see race. They are never “colorblind.” One study revealed that infants recognize racial differences between three and six months of age. Dr. Phyllis Katz’s research (as cited in “See Baby Discriminate” ) shows that by three years white children exhibit an overwhelming preference for same-race friends. By age five, 68% of children sort decks of cards of people’s faces by race over any other indicator. The infamous doll test originally performed by Kenneth and Mamie Clark and repeated most recently by CNN’s Anderson Cooper 360 shows that pre-k and kindergarten-aged children express racial biases that remain with them through adulthood. To be clear, the purpose of this research is not to figure out if your child is a racist or not. The intention is to debunk the colorblind myth and frame an approach to interrupting these troubling patterns. Our country still has a race problem that permeates our culture (resource), plagues our institutions (resource), and affects individuals (resource). We know that children absorb these messages without our help. Not talking about race actually allows stereotypes and generalizations to go unchecked. Dr. Birgitte Vittrup performed a study with 100 families in Texas (also in “See Baby Discriminate” ) that found that mere exposure to peers of other races or reading multicultural books is not enough to counter the development of bias in children; they must be accompanied by conversations about race. These conversations about race should reflect an honest acknowledgement of systemic inequalities but seek to engage the child in enacting solutions. Racism is a powerful system that affects individuals and institutions. Children are steeped in this culture from birth and it should come as no surprise when they ask a question or make a comment about race that gives us pause. Too often I see parents get caught up in feeling guilty for things that their child has said, rather than seizing the opportunity to have a deeper conversation that examines the source of the comment. This guilt also prevents them from seeking out the support of peers who can bring expertise and insights to the situation. This is a true statement, but not a reason to not talk about race with children. It’s okay to say that you don’t know what you don’t know. It’s okay to ask for more time to think before answering a question. It’s okay to take these conversations slowly. Framing tough questions from your child as “teachable race moments” opens up opportunities for your own growth and development as a parent and a citizen. Instead of saying nothing and avoiding the conversation. Make no mistake about it, these conversations will always be tough, uncomfortable and test the very fabric of our character. When we know children are not “colorblind,” that explicit conversations about race are healthy and necessary, and that it’s okay not to have all the answers, it’s easier to be brave and talk about race. Jaime-Jin Lewis is the Executive Director of Border Crossers an education equity nonprofit that provides racial justice training and resources to elementary schools and teachers in New York City. 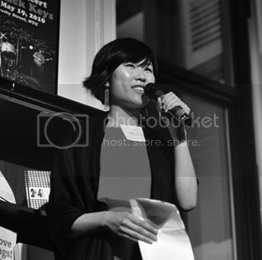 She is Asian-American, born in Seoul, South Korea and raised in Charlottesville, Virginia. She has worked as a committed activist, organizer and educator all along the East Coast and in Buenos Aires, Argentina. In 2011, Jaime-Jin and Border Crossers launched a “Talking About Race With K-5” initiative, which has already trained of over 375 educators from over 75 schools in New York City, as well as over 100 educators nationally. Jaime-Jin was recently cited in the New York Times article, Why Don’t We Have Any White Kids” and the ColorLines article, ”Here Are Easy Ways to Have Tough Talks With Kids About Race.” She also presents at conferences like the National Conference on School Diversity, the People’s Education Convention, Facing Race 2012, and NYCoRE Conference 2013. She had a degree in Urban Planning from the University of Virginia.